It probably hurts your heart just as bad as it hurts mine to post a #TBT of the above. Why? Because these two were definitely on your wishlist in the early 2000's. I have good news and bad news. The fact that fashion of the 2000's are now considered throwbacks is scary as hell! The bad news, however, is even scarier. Those oversized circle belts are kindaaaa coming back. The good news is that these new circle belts have a minimalist-meets-western vibe to them, and they're actually cute AF. Oh, and the Baby G watches. Well, these 'babies' are still on the market (lol). Although colored watches have yet to make a comeback, watches in general are forever timeless. No pun intended. See some fabulous Concho Belts here, here, and here! & while you're at it, go check out some more #TBT Presents posts of mine. 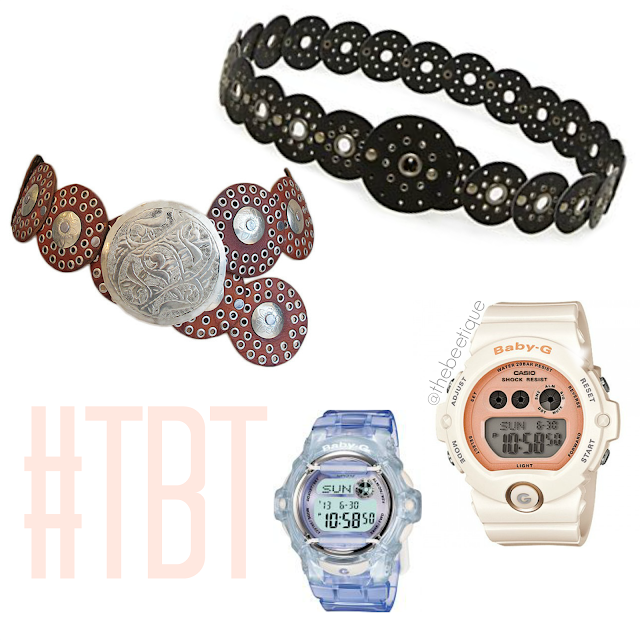 1 comment on "#TBT Presents: Oversized Circle Belts + Baby G Watches"